We are now doing over 150,000 Medical Billing transactions/month for a Healthcare Technology Company in USA. It is an arduous challenge to get familiar with a neurologist's style of dictation and accent to produce error-free reports in fleeting time. It is a concern plaguing even the most experienced transcribers. 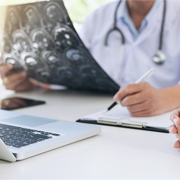 Whether you run acute care clinic, hospital, or individual neurology practice, if you need fast neurology transcription at 45% lesser rate than offered by US-based companies, turn to professionals like us. Outsource2india is already familiar with the intricate challenges faced by neurologists. Our service includes neurology transcription services which are customized for your needs. By accepting digital recordings and transcribes of medical history, clinical findings, procedures, as well as SOAP notes we turn your input into 15+ formats of your choice. The neurology transcription we offer allows seamless multi-platform integration making it one of the best budget-friendly solutions. We want our clients to feel comfortable working with our team of transcribers. Our method includes steps that let you see the underlying efforts that go into transcription services. Why Choose Neurology Transcription Services from Outsource2india? We also provide ENT Transcription Services, emergency room transcription, radiology transcription, and more. Read a case study on how the team at Outsource2india worked as per the Australian time-zone to automate 2000 STAT transcripts as per the client's quality benchmarks. Our AR Management & Medical Billing services brought the average AR days down from 34 to 23 days & increased collection percentage from 53% to 61% in 6 months. I appreciate your help! I am very impressed by the efficiency and the quality of medical transcription. Outsource2india is a reputed provider of neurology transcription services in India and overseas. We have 20 years of experience in an array of medical transcription services in which we specialize in neurology transcription. We provide customized transcription that specifically designed to save your time and money which is otherwise spent on labor and technology. With a team of 100+ certified medical transcriptionists (CMT), we provide the best client experiences worthy of mention. Reach us now if you have requirements related to neurology transcription so we can help you with customized solutions.